The 2013 RAV4 has only been on the market about 2 months, but holding off a couple more months may save you gas, or maybe even save your life. Please see our updated report on the RAV4 and crash test results here. The new 2013 Toyota RAV4 has retained the strong sales that made it the leader in the segment it created. With its new look, redesigned tailgate, and the spare tire off the back bumper, the new RAV4 has all the right moves to make it the segment leader for years to come. However, there are two very important things that buyers should be aware of if they are considering buying a 2013 RAV4 in the coming months. Although the RAV4 recently passed the traditional safety tests with flying colors, it asked to be excused from the newest, and one of the most important tests of all. 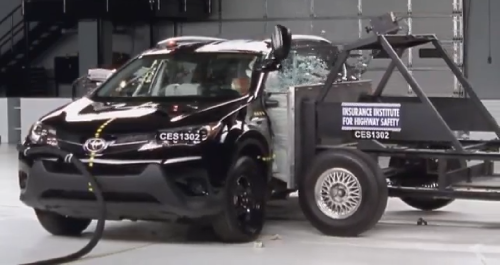 In a departure from normal testing rules, the Insurance Institute for Highway Safety (IIHS), that conducts the test allowed the RAV4 to skip the small overlap frontal crash test. This is a test that measures how well a vehicle will do if it crashes into an oncoming car or a stationary object, like a tree, but only hits it with a small portion of the front of the car. It is the newest test done by the IIHS, but the Institute says that fully 25% of serious and fatal accidents occur in this way, so it is an important measure of a car’s safety. Of the 13 compact crossovers tested recently, only one got the highest score, the Subaru Forester. One got an acceptable rating (Mitsubishi Outlander Sport) and all the rest did very poorly. Some dramatically so, as shown in the video below. Toyota just released the 2013 RAV4 this year after a full redesign. It has been on the market now about two months, so there are perhaps 15,000 of these new RAV4s built and sold, or waiting to be sold right now on dealer lots. However, Toyota asked that the RAV4 not be tested by the IIHS, and the Institute gave Toyota a pass. Toyota did not want the bad press associated with a failing grade and asked that it be given a chance to make changes to the RAV4. Those changes will only be to vehicles it builds going forward. As of now the changes have not been made, and the vehicles for sale are not as safe as those that will soon be built. Because there are safety improvements coming to the RAV4 in the very near future, we suggest buyers may want to wait. Why would any buyer want to own the last RAV4 delivered that did not have this important safety upgrade? We expect the RAV4 modifications to be made soon, perhaps within this model year, so if you are shopping for a RAV4 now, and you can hold off a few months, it may be worth the wait. Lexus is now developing its own premium version of the 2013 RAV4. The new vehicle, that might be called the HX300h, will have the proven Toyota/Lexus hybrid drive using the 2.5 liter four cylinder engine plus an electric motor. All together the new vehicle is expected to have about 230 horsepower. This is much more than the current 176 that the RAV4 has. The new Lexus will also have more interior treats such as perforated leather instead of the SofTex in the top version of the RAV4. Most importantly the new Lexus version of the RAV4 would have a dramatic improvement in fuel economy and green credentials. By analyzing the characteristics of the RAV4 and by looking closely at the fuel economy the hybrid drive is able to achieve now in vehicles of similar weight, Torque News estimates the new Lexus RAV4 version will get about 40mpg city and 35 MPG highway for a combined score of 37 mpg. That is almost 50% better than the combined score of 2 5mpg the current RAV4 now has. The new vehicle would also have a commensurate reduction in C02 emissions and may qualify for some benefits such as special airport parking, HOV lane permission, and possibly even local tax credits or rebates. Lexus may also build a powerful V6 version of the RAV4 which would make it one of the top performers in the segment. So if you have been shopping the 2013 RAV4 and safety is a high priority for you, or you wish you could get a premium hybrid, or more powerful RAV4, you may want to re-evaluate your timeline for buying.